Welcome to the second edition of our monthly Newsletter, a product of hard work and shameless exploitation of the Distinguished Members without paying them anything at all. 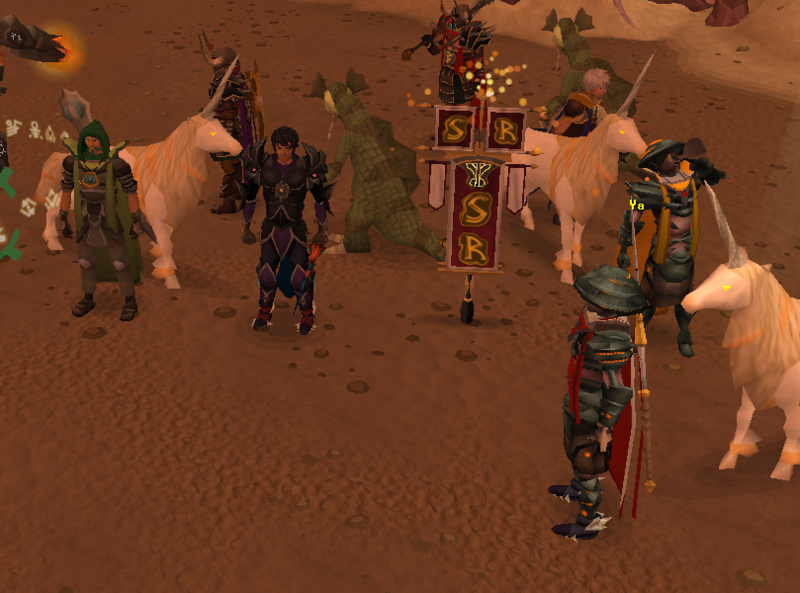 Since the last issue, both RuneScape and our little community has gone through some substantial changes. The world of Gielinor shook as two gods battle it out amongst themselves, while here in our community, we set the lofty goal of updating ourselves to a new, improved, version. Whatever happens, both in RuneScape and in this community, the Newsletter Staff wants to say that we are proud that the community has risen to the challenge and you have ensured that our Content Drive had a strong start. Let us keep up the morale and dedication during August as well! Events are coming back to Sals! In the last few weeks, events have started again, much to the delight of the community. Castle Wars and Stealing Creation events have popped up here and there, but most notably, the revival of the weekly skill competitions and bossing masses has garnered a lot of interest and activity from the community. The bossing masses have been happening on and off over the last few years, but has been recently been revived by Sk8skull. Although high priced drops have been scarce, clan members have enjoyed the chance to try out new bosses and test their luck. You can check out the topic in Runescape Events to see the latest details on future events, ask for advice, and see pictures from past events. All are welcome to participate and no one is discriminated based on levels or gear. If boss hunting isn’t really your scene, then maybe some friendly skill competitions suit you better. Each week from Monday to Wednesday, voting for you guys to pick the next skill competition. Competitions typically last 2 days and are often very intense. Rewards are not limited to just the winners though. Everyone who reaches a certain participation requirement also receives a participation prize as well. More information can be found in the latest skill competition topic in Runescape Events. With RuneScape 3 came the New Interface System (NIS). It has faced much praise and criticism, but it's here to stay. Why not check out Hunter's topic to see how others set up their own interface? You might get some inspiration, and we would love to see what you have done with your interface! It has been a while, but we have a new content drive! Things you can win include achievements, points, and our respect - so have a look at the official Content Drive topic and get crackin'. You may also have noticed that Salmoneus is not the only one making changes to the sites. Since his life does not, in fact, consist entirely of managing the site, he made sure that DMs and staff can now do it for him! That means faster updates to the site and less work for him, which is a win-win situation if you ask us. There are many things the denizens of Sal's don't agree upon. Among them, the questions of: is Runescape in a steep decline (maybe), does Lilshu deserve all of his upvotes (he does), and is the role-playing room an actual forum (it isn't). And while there are more topics we don't agree upon than what we do, there is one thing everyone on Sal's knows to be true: that we have no idea who Aabid is. For those of you who do not frequent the forum side of this fansite (to which we wonder why you are reading this section of the newsletter), Aabid arrived on the scene a few years ago appearing to be a bright-eyed and bushy-tailed new member full of questions about League of Legends, questions about Runescape, questions about the forum, questions about the time of day, and dear god please stop asking question. He managed to accumulate the highest "down vote" count for a member of the forum. Quickly rushing to his rescue, some members took it upon themselves to "up vote" any post of his that even remotely resembled a coherent thought (or was sufficiently pathetic). His behavior became increasingly erratic, as he sometimes acted like a normal member, sometimes like a child, and sometimes like a textbook example of how not to troll. The Ballad of Aabid seemingly came to its most-recent head in a topic that equated him to Neo from The Matrix who was chosen to keep posting inane questions about League of Legends until he saved the forum from ruin. The topic quickly died but it's legacy lives on inside the creator's ego. We believe there are three possibilities. Either he is a collection of members posting under one account, an incredibly lazy individual troll, or a an allegorical forum member depicting man's innate need to be noticed. You decide, America. The staff is a collection of power-hungry narcissists whose only collective purpose is to further their own power on a Runescape Forum. We all know this to be undeniable fact, and in most situations the member-hate is evenly distributed among the various members of the staff. However, this is not the case with The Tyrant. Recently, and in years past, he has been the biggest target for complaints about warns, bans, topic closings, post deletions, serial rapes, foreign accents, among a host of other unspeakable acts (including a propensity to undercut harsh criticism with an inappropriate use of the " " emoticon, but that's only completely infuriating). However, this month Adam? took it upon himself to make a topic that achieved his two mission statements in one fell swoop: 1) to stimulate activity through topics that are reflective of the community and 2) look at me look at me look at me. The topic called for Yuanrang's removal from office, and tens of members cast a vote. Impeachment was the most popular option, but sadly a majority was needed in order to move forward with more formal proceedings. The members of Sal's will have to wait a full calendar year before attempting a grass-roots usurping of Yuanrang, and although it may dishearten some, we must remember to take pride in knowing we belong to a forum that is a self-governing democracy. If you're a regular subscriber to "The Santafish Monthly", then you may remember that our last issue commented on the controversy surrounding multiple pony-related fads that had invaded the forum. This month has seen the fighting die down, but a certain member decided to give the show a "chance" and posted a blog entry about the experience. Adam? watched the first two episodes of "My Little Pony: Friendship is Magic" with two friends (Matt and beer), and what they discovered about friendship may surprise you! Adam? is happy to report that he now knows the names of all the major characters, and attributes this to the incredible characterization and hilarious personalities of the ponies. If you ever have pony-related questions, or just want to discuss anything related to friendship, be sure to PM Adam? on the forums. Today on August 1st, it is exactly 58 days ago since the Halls of Distinction, the private forum for Distinguished Members, noticed a slow surge in enthusiasm and activity which eventually grew to massive proportions. During these past 58 days, we have managed to make over 1000 posts, and we even had to create a whole new subforum for all of these new discussions. That subforum is called "The Alan Parsons Project" which we mentioned in the July issue of this Newsletter. In this subforum, we have planned, discussed and worked on a variety of topics and ideas, some of which you have read about lately. The RS3 Content Drive, the Newsletter, the upcoming Achievement forum modification and even the polish of both subforums and pinned topics were all a result of these discussions. We have also done quite a few tweaks and changes behind the scenes as well. However, we do not intend to call it a day and leave things like this. We have quite a few other crazy ideas found in a pinned topic called "The Wall of Crazy" in our secret subforum. Some of these ideas might never happen, but some will become our next project to work on once we have spent some time to make sure that our ongoing projects run smoothly. We do not want to jump into a new project right now because the Content Drive is currently our top priority, but we will need to do something once we have updated most of our site content. In time, you might expect to see small teasers like this being put in the Newsletter just to remind you all that we are as dedicated as you are, and that we will keep working hard to make our community even more awesome, if that is even possible! It is important for you all to remember that everything that has happened in the last 58 days has just been the product of several crazy ideas that we decided to put into motion. We truly hope that you all will enjoy what we have done so far, and we hope that you will enjoy what we have in store for you. If you too have a crazy idea that you would love to see in a future project, make a topic about it in the Forum and Site Feedback forum. Maybe your crazy idea will make it to the Wall of Crazy! Fatalysm got a new pet snake (his name is Loki)! Fatalysm also wants to get a new tattoo. You know what that means... the graphics forum is now full of snake related concept art. It's definitely worth a viewing, and if you're real nice, he may even design you a tattoo of your own. The staff has been busy cleaning up old pinned topics and dusty subforums. Let us know if we missed anything! Fatalysm has started a topic where you can discuss further changes.